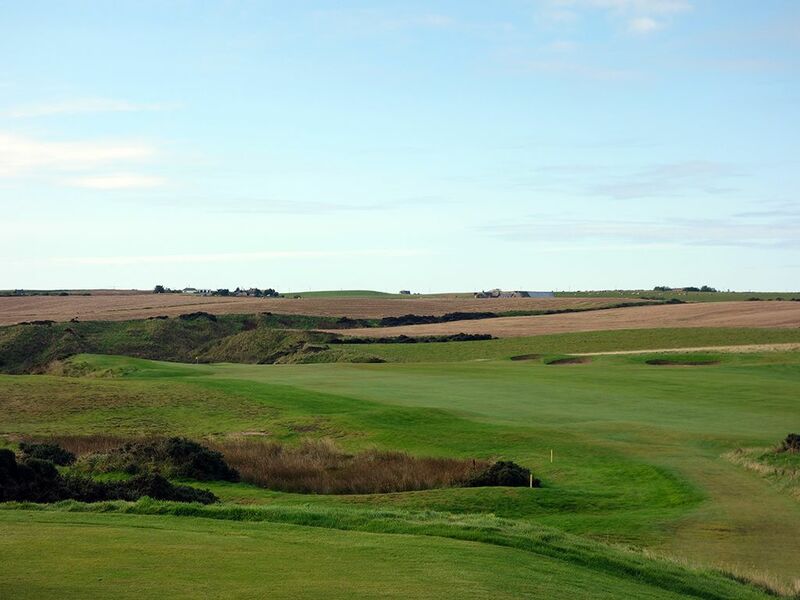 Course Website: Official Website - Visit Cruden Bay Golf Club's official website by clicking on the link provided. Accolades: Ranked 2nd in Scotland by Golf Course Gurus. 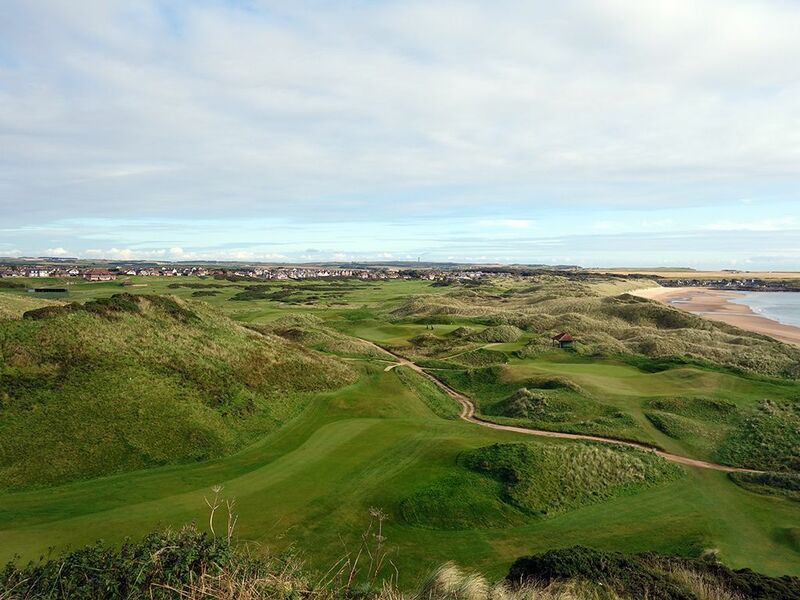 What to Expect: Cruden Bay features an endearing combination of uniqueness, class, fun, and beauty. Upon arrival at the club you'll be greeted by a member that welcomes you to the club and offers a quick tour of the facilities including the finest 180 degree view I've ever experienced from a dining room. On one wall of the dining room you'll find a board with large lettering displaying the last names of the guests playing that day and welcoming them to the club; a classy and unpretentious move indeed. The lower level of the clubhouse is where you'll find the pro shop that features a commendable collection of logo items to shop from (I chose a navy blue necktie) and where you check in for golf that day. 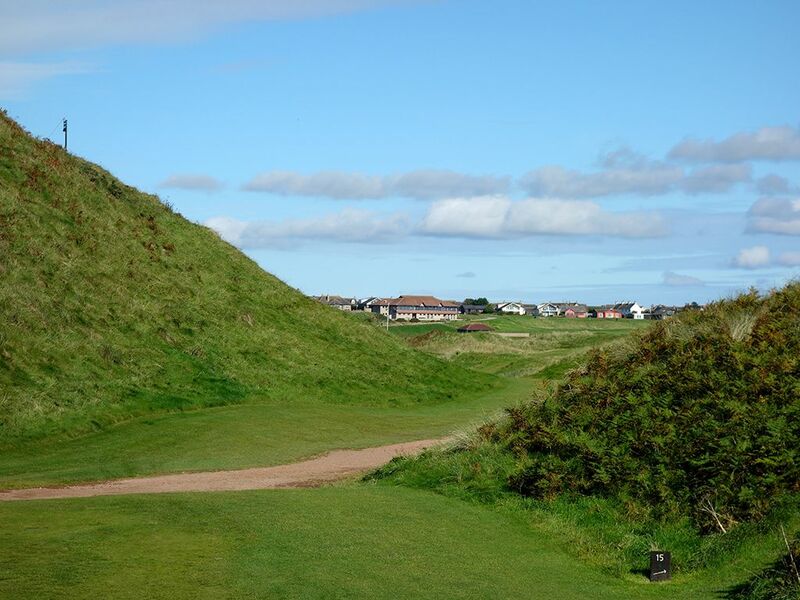 Green fees include all 27 holes at Cruden Bay so it is a great idea to allocate enough time to play them all, especially since the nine hole course gets much less play and you'll be able to enjoy any pace you want. As you stroll out on the course and put your first peg in the tee box you'll instantly be impressed by the conditioning of the bent and fescue grass blend of turf. The opening tee shot plays away from the clubhouse to a fairway that sits below the town which begins the adventure away from reality and into a fantasy like experience. 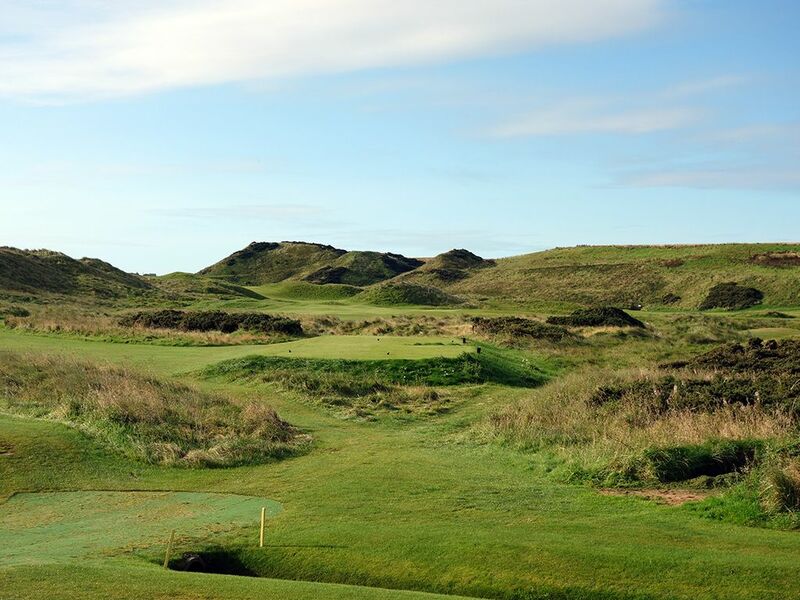 Players begin to encounter the uniqueness of Cruden Bay as they face different elevation changes, the occasional blind shot, a driveable par four, and terrain framed at times by gorse and/or marram grasses. 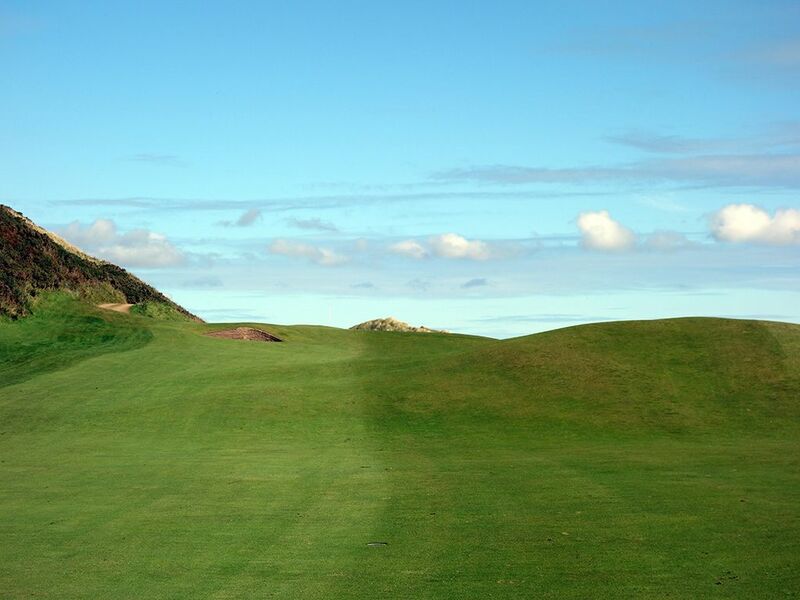 The Kodak moment comes at the 9th tee where players ascend to the highest point of the course and are offered one of the most impressive views in all of golf with a panoramic view of the golf course with the sparkling Moray Firth being the perfect neighbor to complement the scenery. The back nine is one of my all time favorite inward collection of holes with the three hole stretch of 13-15 rivaling any par 5, par 4, par 3 run in the world. 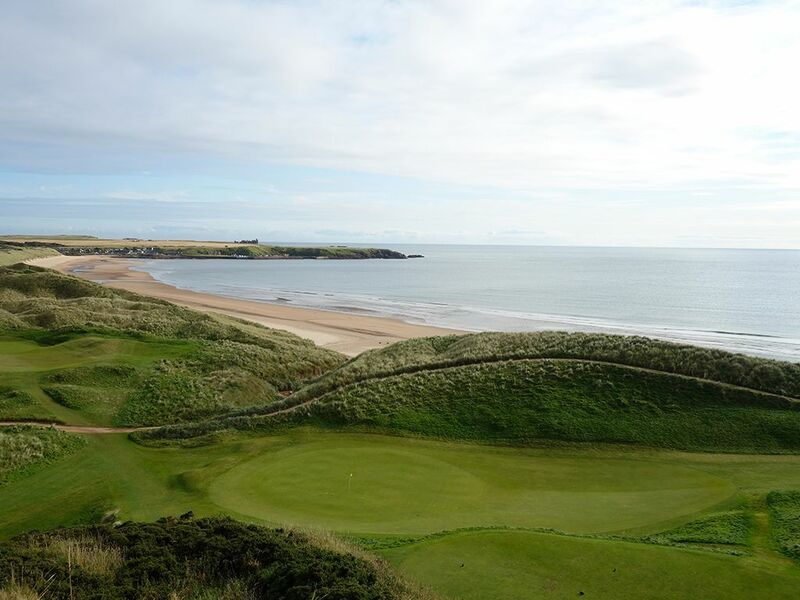 I found the experience to be similar to Alister MacKenzie's famed Lahinch course in Ireland with an extra touch of magic that is tough to describe and can only be experienced. Ultimately, I loved Cruden Bay. I couldn't wipe the smile off my face all day and could hardly wait to discover what surprise the course would unveil next. If you don't include Cruden Bay on your trip to Scotland you are no friend of mine. Signature Hole: 9th Hole – 462 Yard Par 4 – There are only a handful of times I have stood on a tee and been almost speechless, but one of those occurrences was on the 9th at Cruden Bay. Interestingly though, the grandeur of the view wasn't looking down the fairway towards the hole I was about to play, but looking backyards at the stunning aerial view afforded of the holes I had just completed. In addition to a captivating view of the front nine rolling linksland complimented by sparkling ocean, players are given a peak at the closing stretch of holes which only heightens one's anticipation of what is to come. 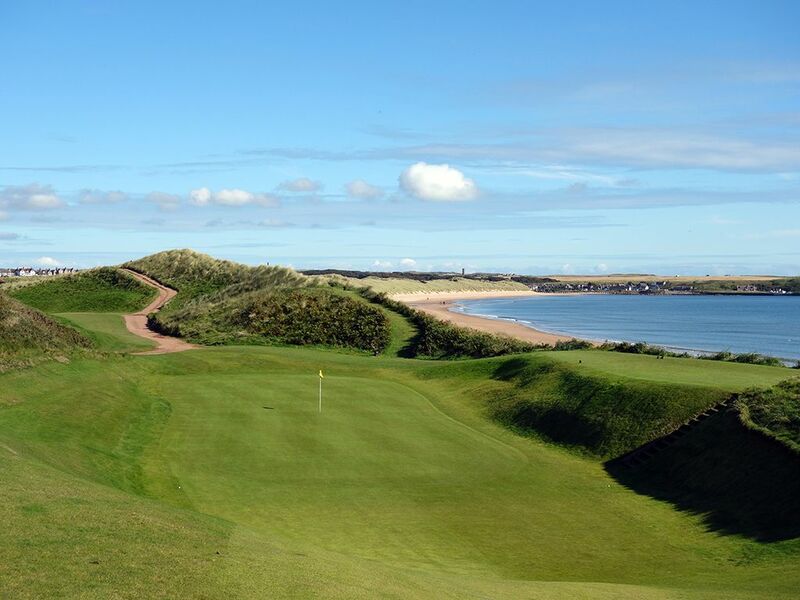 To this day when I think of being in Scotland, the first visual I get in my mind is the view of Cruden Bay's matchless links from the 9th tee. 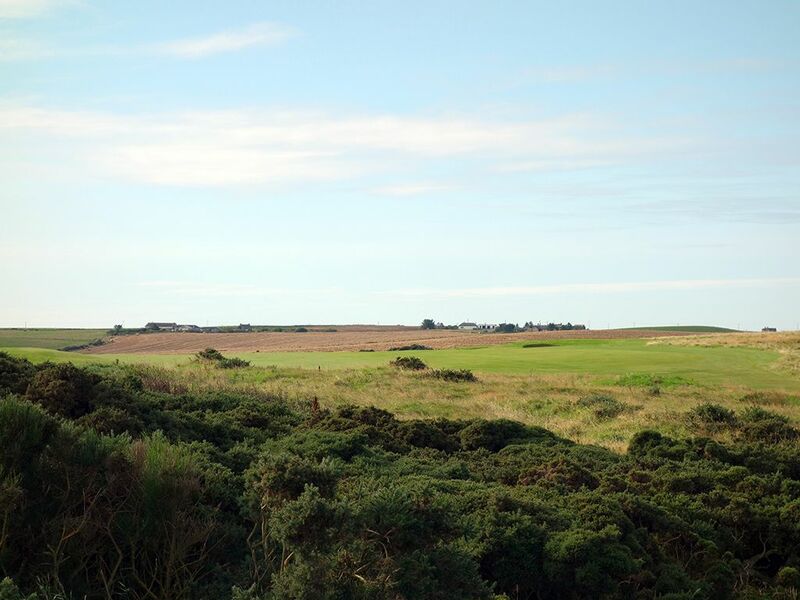 The hole itself plays from the highest point on the course slightly downhill to a green out on a point where views to the left are of the ocean and to the right and in the background are of farm ground. A lengthy two-shotter with seven bunkers to contend with along the way add up to a difficult par considering how distracted your mind can be after soaking in one of the best panoramas in golf. 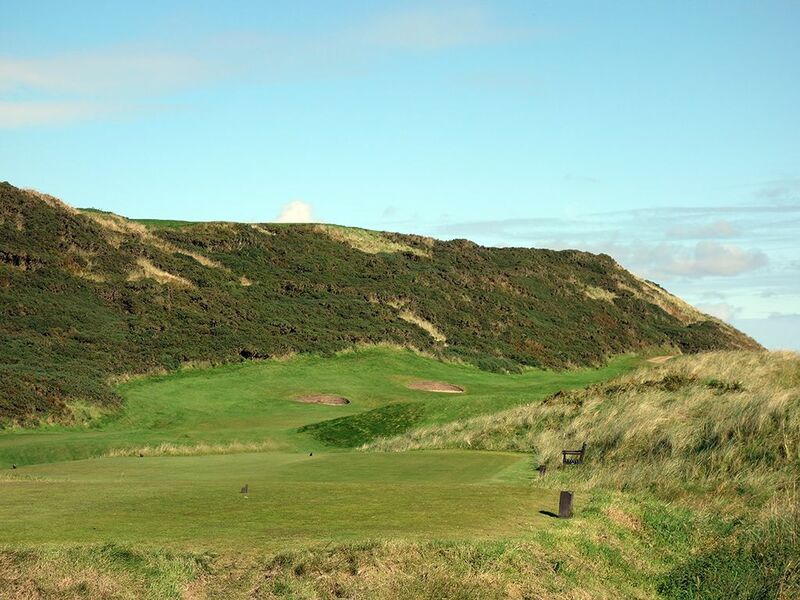 Best Par 3: 15th Hole – 195 Yards – Love it or hate it, "Blin' Dunt" is the most memorable one-shotter on the property. Blind from the tee, players must rely on the hole sign which shows a depiction of the green with a tee placed in the peg hole closed to where the flag resides that day. Given the blind nature of the tee shot, the hole sign also asks players to wait for the bell to sound before teeing off which will be rung by the group ahead of you. The large dune that blocks your view of the green is also a strong reminder to get your tee shot airborne so that you don't plant it in the side and face a blind shot with your second effort. 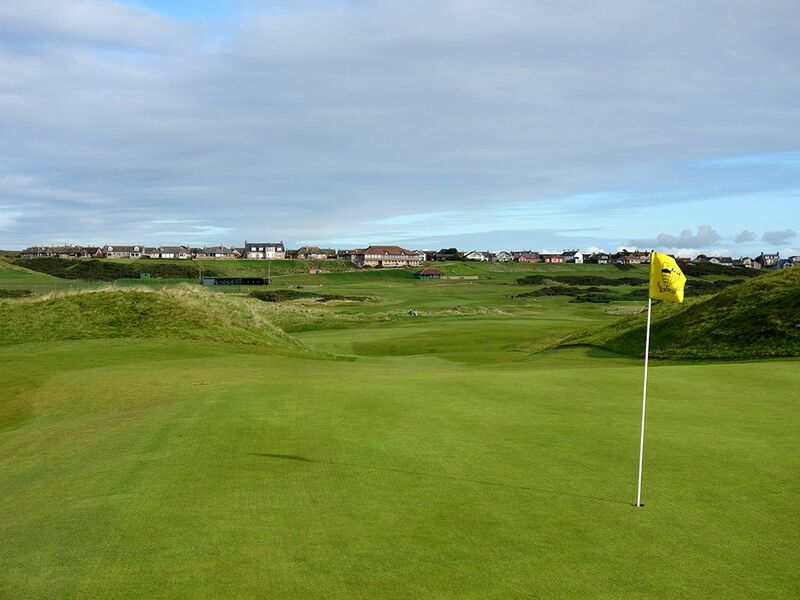 Players not willing to take on the dune fronting the green will play this hole as a dogleg left by laying up to the fairway up the right side before wedging their approach onto the putting surface. There is no need to worry about bunkers or crazy green contours here, the blind tee shot is enough of a test; perhaps more mentally than physically. 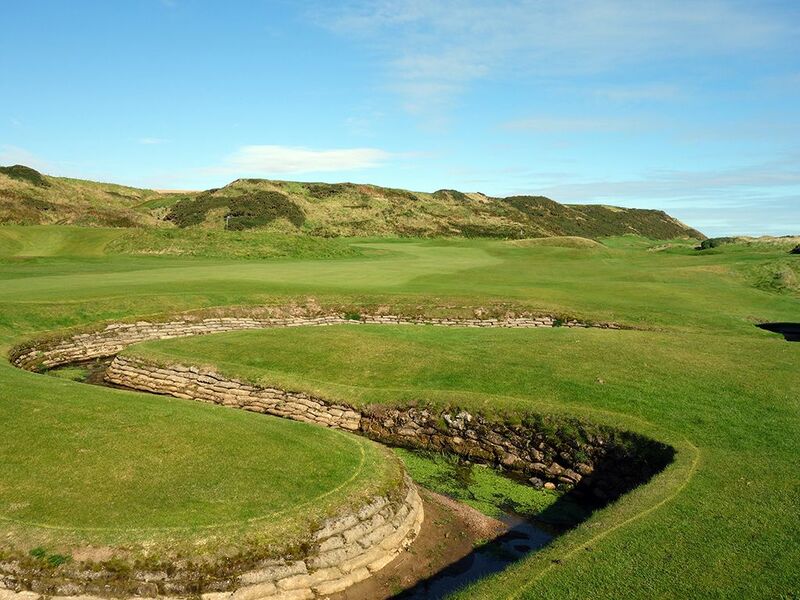 It is a great hole that unfortunately would never be designed today or ever featured on a course the Tour visited, but this is the kind of character that makes Cruden Bay such a unique course to experience. Best Par 4: 14th Hole – 431 Yards – Named "Whins," the 14th was is one of my all time favorite holes in Scotland. The tee marker facing you straight into the large dune that frames the left side of the hole while the fairway angles away to the players right and hugs the dune all the way home. Missing the three fairway bunkers found on the left side of the short grass is imperative in your goal to reach the green in two, but don't get too greedy driving down the right side since a slice can send your ball to the ocean. Like the 15th, a diagram of the green is offered on the tee since the approach shot is blind to the putting surface. Similar to the punchbowl greens found at MacDonald and Raynor courses, Cruden Bay delivers a "bathtub" green here with a sunken but rectangular putting surface. It is tough to verbalize the excitement one feels when hitting a blind shot to a bowled green and the anticipation of discovering how close to the hole your ball is. 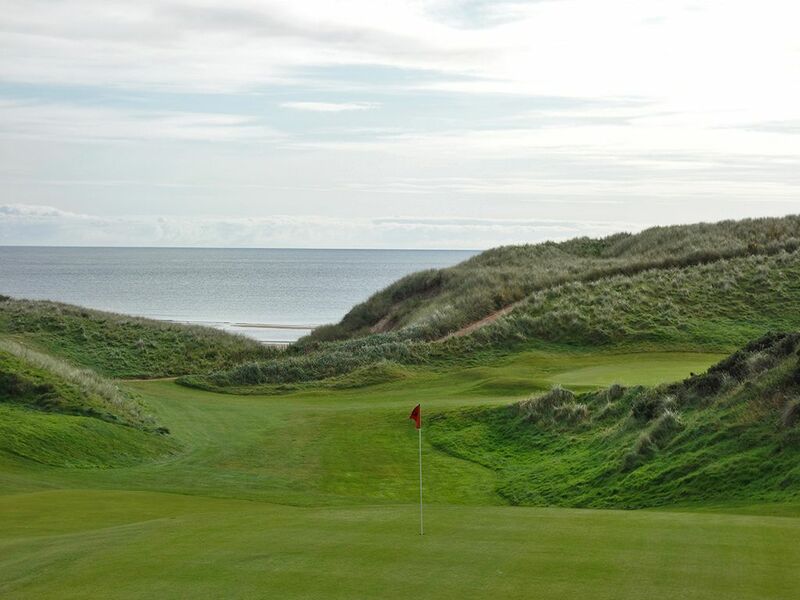 With the ocean on your right, a huge dune on the left, and a bathtub green to attack from a blind approach, it all adds up to one of the most memorable holes you'll ever come across. Best Par 5: 13th Hole – 571 Yards – The back nine at Cruden Bay is a simply a treat with the stretch of 13-15 being flat out fantastic. The lengthy par five 13th is a three-shot delite that requires thought and strategy from tee to green. On the drive players will want to avoid the large bunker left of the fairway as well as the partially hidden bunkers on the right which in the driving zone. If you are playing downwind and crush one, you could bring the burn into play which cross the fairway 325 yards from the back tee, however playing into the wind can mean dealing with it on your second shot. 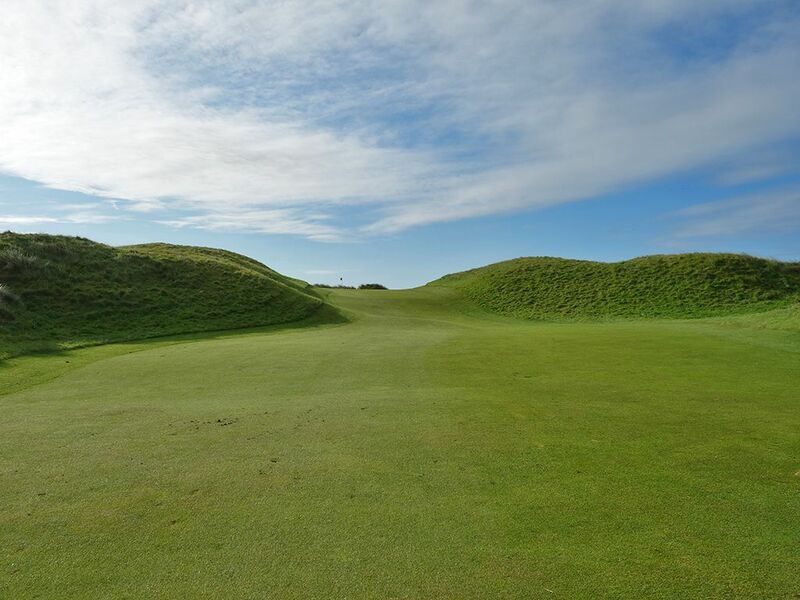 The fairway continues to wind in between small mounds on a steady ascent to the green site which is tucked in next to the base of a mammoth dune and fronted by a carved out hill with a chipping area below. From the preferred angle on the left side of the fairway, it is common for only the top half of the flag to be visible on the approach and to miss noticing the partially hidden bunker lurking short and left of the putting surface. 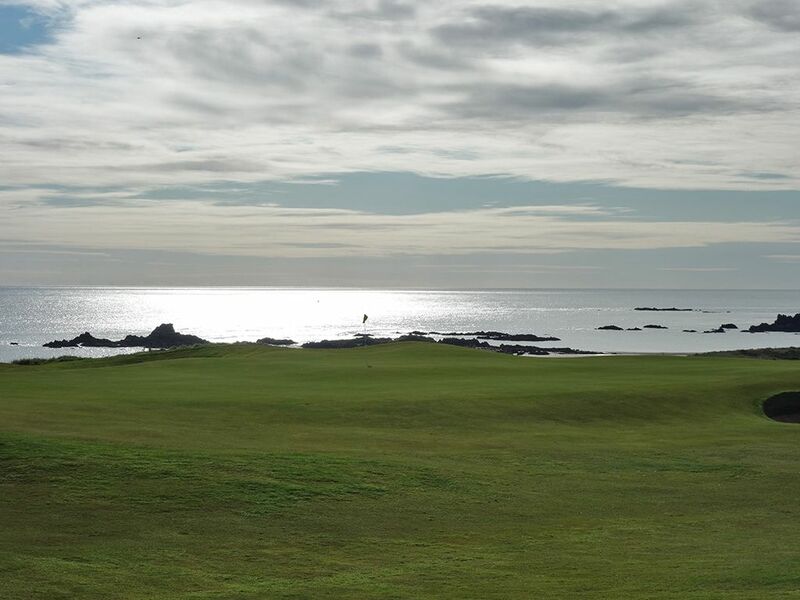 The 13th is a great hole in an enchanting coastal setting that stands as one of the best par fives in Scotland. Birdie Time: 8th Hole – 250 Yard Par 4 – When I first got to the tee I thought the 8th was a long par three, but to my surprise this 250 yarder is earmarked as a par four and instantly becomes the best birdie opportunity on the course. 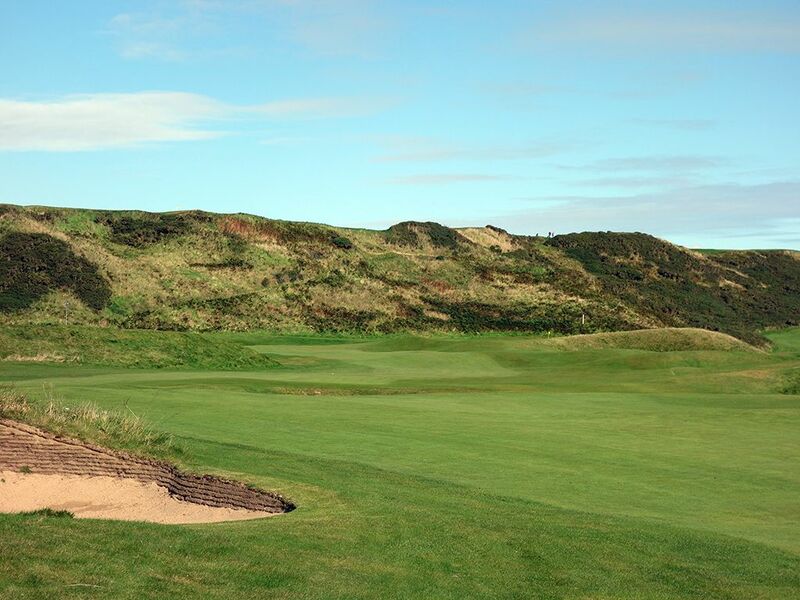 Located in a perfect amphitheatre setting surrounded by dunes, the green site doesn't feature a single bunker to contend with an inviting entrance to the putting surface. With only wild misses being penal enough to cause concern, the only other place with a hint of concern is short and left which would leave a uphill chip that you might get under and pop up. Anytime you can take a club other than a drive and reach a par four with your tee shot, you have a hole you better score well on and that is exactly what you have here. Bogey Beware: 7th Hole – 458 Yard Par 4 – Sporting one of the most unique names for a golf hole, "Whaupshank" can't be the kind of name that breeds confidence going in. The hole tees off over a burn from the back tee and needs to carry 200 yards to reach the fairway. 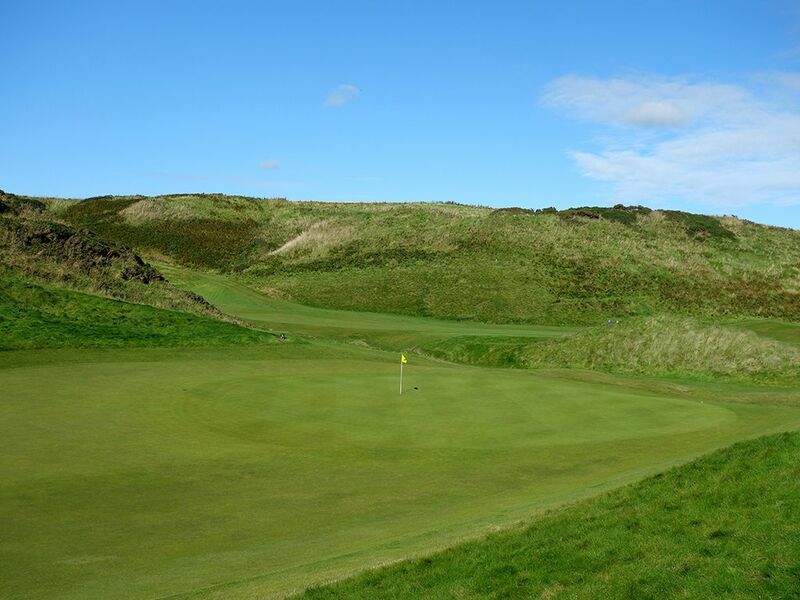 The fairway then slithers its way uphill between dunes that steadily tightens as it reaches the green site. This hole plays back towards the sea which means it can often play into the wind which normally isn't that big of a deal until you consider the false front that is quick to repel weak approach shots. Shots that don't carry the hill and penetrate the wind will tumble back 30 yards and create an awkward chipping distance for many players. The green is quite narrow so accuracy must be paired with deft distance control to conquer this beast. This is another hole that I truly love, but your scorecard may not feel so good afterwards.